How can you get a cheaper electricity & natural gas bill in Alberta? Make a Better Choice and choose Park Power as your energy provider. 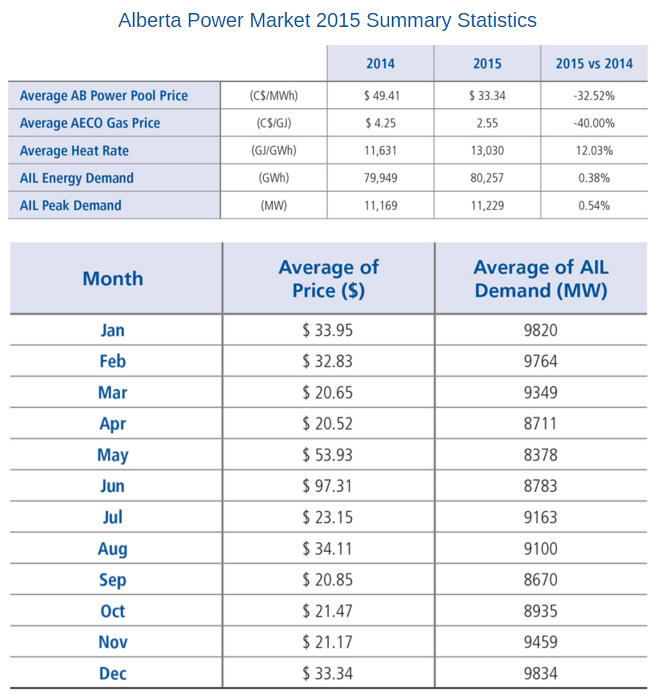 We can help you take advantage of the record low electricity prices in Alberta right now and help save you money. Some consumers in Alberta might wonder how its possible that we can reduce our fixed electricity rates in Alberta by 10% heading into 2016 (from 6.3 ¢/kWh to 5.8 ¢/kWh). Some will wonder why their Dec 2015 Regulated Rate Option (RRO) Rate was 5.3 ¢/kWh when Park Power’s Floating Rate was 3.6 ¢/kWh (32% less). Park Power is a smaller, more nimble energy provider than our big corporate competitors. As such we are able to take advantage of the low wholesale power market prices more quickly than the cumbersome, traditional utility companies and pass the savings onto you. Are there really savings to be had? Well if you look at latest power market data below you will see that the average wholesale price for 2015 was $30.50/MW, the lowest yearly average settle price for electricity in Alberta since deregulation. Have a look at what you are paying (¢/kWh) and compare to what you could be paying after you Sign Up with Park Power. Customers can choose our low Floating Rate to take advantage of the savings offered right now and have peace of mind knowing that they can switch penalty free to one of our awesome and stable Fixed Rates should the wholesale market power price start to rise. Start 2016 off right by reducing your home utility costs while experiencing paperless billing, superior customer service, and profit sharing with local charities through our Community Partner Program. So what do we do to get the distribution charges lower than our usage? I’m floating elc on Epcor and floating gas ob Direct. Rates for the commodity itself is great but I consistently pay more to both in “fees” than “commodity. There is no competition in the transmission and distribution sectors of the market so there is no choice. Therefore to reduce your delivery charges you have to reduce your usage. One thing I can say is that over the past few years, the usage rates have consistently declined and the delivery rates have consistently gone up.